Brings out your inner disco dancing pirate! Okay, nobody ever accused pirates of being subtle. Since they live on the outer fringes of civilization, and prey on unsuspecting ships and port towns while constantly on the run from Admiral Johnny Law, you would expect them to consider keeping a lower profile. But, the open sea is a big place, and sometimes a flashy reputation is more useful than stealth. When a band of pirates boards your ship wearing tons of bling, you'll know these buccaneers have plundered plenty of ships before, and they'll have no problem plundering yours! 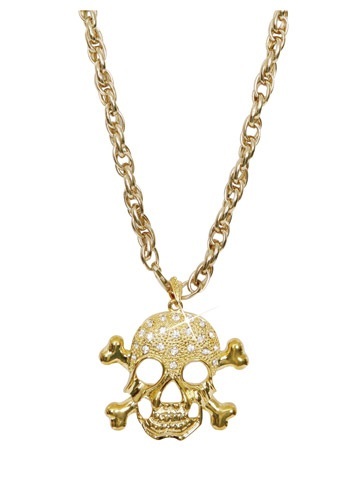 Show off your pirating prowess to everyone you run into with this Gold Pirate Necklace! This is a classic symbol of piracy with an ostentatious twist. The matching gold chain and skull and crossbones pendent are more than enough to display your wealth on their own, but everyone will be dazzled when the sparkle from the diamonds hits there eyes. It's definitely not subtle, but would you really trust a subtle pirate? Us neither!